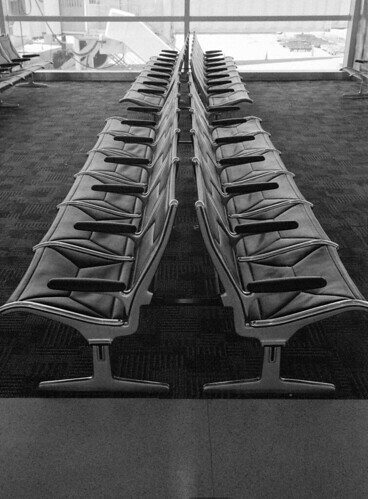 DETROIT AIRPORT chairs, originally uploaded by stephenwilliamlaw. Here's a photo I took waiting for plane at Detroit airport last month. Click to see other photos on my flickr site. A photo buff told me that black-and-white photos highlight texture. The repetition of the chairs works really well in this one. It wouldn't have worked in color, and I wouldn't have thought to take the picture, seeing in color as I do. 1. Philosophers employ great deal of very clever (sometimes endless) logic in their arguments. 2. They seem to pick arbitray an starting point or an isolated observation as a basis for these very clever arguments. Wouldn't it make more sense to start with the most basic assumptions then build on those assumptions to create a solid philsophy? Of course - Descartes proceded from the most basic assumption there is (your own existence) to his own world view whilst Francis Bacon's method was to go from axioms to theories via induction in a more mathematical way of viewing the world. It would seem though that this way of building a solid world view by applying logic to basic assumptions is traditionally more the realm of science then philosophy.